This note will highlight how the new wind farm that is currently being built in the fresh waters of Lake Erie, will bring potential disaster to the people who rely on this water in the City of Cleveland and surrounding areas in Northeast Ohio, Ohio, 4 border states and Canada. This wind farm will potentially bring a far worse clean drinking water issue, than the current clean water drinking crises, which is currently affecting thousands of citizens in Flint, Michigan, with their lead water issue. Additionally this wind farm will kill thousands of species of migrating birds, that rely on the fresh waters and clean flying area across Lake Erie every year. Unfortunately the loss of these birds will not be able to be counted, as they will sink and go to the bottom of Lake Erie. Additionally the wind farm will kill the world’s greatest fresh water stocks for walleye and perch fishing in North America, and probably the world. Other fish will be affected as well, including the steelhead trout, whose fishing is so prevalent in Lake Erie and the rivers surrounding Lake Erie. Today, according to most any studies that you read, 97.5% of the earth’s surface water is salt water. You can’t drink salt water, or you will die. 2.5% of the world’s water is fresh drinking water. 20% of the world’s fresh drinking water today is located in the Great Lakes. Lake Erie today has 147 trillion gallons of fresh drinking water, and supplies millions of US Citizens, Clevelanders, and other residents surrounding Lake Erie’s 871 mile perimeter coastline, and 45 miles across to Canada, with depths ranging from 5 feet deep, to nearly 210 feet deep. Today many in the world are saying that, “fresh water is the new oil”. This is because of water scarcity, and the world’s growing population’s thirst for fresh drinking water, either to live, for crops, manufacturing, all types of industries, rural and urban life. Lake Erie is truly a Gem to be protected and kept clean. 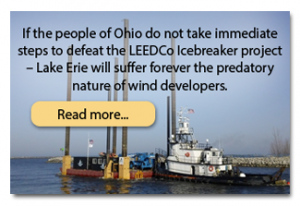 Why Build a Wind Farm in the Fresh Drinking Waters of Lake Erie? So the question is, why are environmental advocates for green energy pushing and pursuing a wind farm and the industrialization of Lake Erie? The current Lake Erie wind farm project, plans to build 6, 500 foot wind towers to start with, at a cost of $120M (with over 50M$ of this money coming from US taxpayers) at $20M per wind tower. With this total of 6, 500 foot towers being put in place at a total cost of $120M, the final goal of Lake Erie’s industrialization is for 1200 wind towers, possibly completely destroying Lake Erie’s fresh drinking water, wildlife, both in the air and in the water, and beauty, for a total, never to be re-paid by electricity used or other energy costs, and never to break even, for a total cost of 1200 wind towers, X $20M, equaling $24 billion dollars, WOW! And Why? The advocates for this wind farm say that they want to use Lake Erie as a clean energy field because “this will be one of the world’s first fresh water wind farms.” This begs the question, why have all the other offshore wind projects been in salt water, or brackish water, or in the ocean? Why have there been no large scale fresh water wind farms? The answer is simple: Because it’s fresh water, and people drink fresh water, and they don’t want to foul it up, with hulking, bottom piercing, rusting, inefficient, monstrous wind towers, that can be susceptible to ruining all of the fresh drinking water, and wildlife habitats, in which these wind towers are placed. Also, salt water does not freeze over. The fresh water in Lake Erie will freeze over, as it does every couple of years, which will potentially snap these 500 foot wind turbine poles like toothpicks. Who will clean up this type of massive pollution, eyesore and environmental disaster, if this happens? If Lake Erie drinking water turns into the next Flint, Michigan water issue, but on a much more massive scale, who is going to be responsible? I guess the real answer to that question is, who cares? This is being done to save the planet, remember? Also, it is being done off the shores of Cleveland, and who really cares about Cleveland, Ohio? Not many people have been to the exact location on Lake Erie where they are currently going to put up the 6, 500 foot towering windmills in Lake Erie, in 65 feet of water. I’ve been out there, on the water in the exact location of the proposed wind towers on Lake Erie, have you? Have you been out there Senator Brown? Have you been out there Governor Kasich? Have you been out there Mayor Jackson? Have you been out there Congresswoman Kaptur? Have you been out there Congressman Joyce? Have you been out there County Executive Budish? The project itself sits about 6 to 7 miles offshore of Lakewood, Ohio, AND unfortunately half way out to the site sits the City of Cleveland’s Water Intake Crib. You know, the Water Crib that provides 168 million gallons of drinking water to Cleveland residents and millions of Ohioans every day, 11 million citizens a day. Now how deep are the footings, or the base boxes of the towers going to go down, when they are drilled directly into what’s known as the Dead Zone, into the bottom of Lake Erie’s Bed Rock? Or placed in boxes that are fastened to settle on the bottom of Lake Erie, thru 50 to 100 to 150 years of toxic sludge, in the Dead Zone. We do know that the footings for the new Cleveland Browns Stadium along the lake, on shore, had pilings of over 340 feet deep. So how deep does a company from Norway mind you, not America, yes this US$ taxpayer funded project is going to a company from Norway, how deep is this Norway company going to have to drill into Lake Erie’s bottom, to secure just one 400 foot to 500 foot tall wind tower, at 65 foot water depth, under the fresh drinking waters of Lake Erie? The project will be done with pilings, or an unproven box method, that our leaders are happy to experiment with, in our 147 trillion gallons of fresh drinking water, aka our awesome natural resource, Lake Erie. Now why do they call this area in Lake Erie the Dead Zone? It’s called the Dead Zone because of what sludge sits there above and on the bottom of Lake Erie, after the years of abuse of Lake Erie during Ohio’s industrialization, from the mid to late 1800’s, to the early 1900’s, all the way to the 1970’s. This abuse continued until local residents, state governments, and the federal government did an excellent job of cleaning up Lake Erie, which makes Lake Erie one of the cleanest fresh drinking watersheds in the world today. So why mess with this fresh drinking water? So back to the Dead Zone. How deep is the Dead Zone before you get to the bottom? What is in the Dead Zone? The Dead Zone consists of layers of over 30, 50, 100, and by some counts 150 years of cumulated carcinogens sitting on top of themselves, such as lead, magnesium, arsenic, mercury, and many different hazardous toxic chemicals, that have finally settled down nicely, at the bottom of Lake Erie after years of abuse, finally not harming Lake Erie’s current fresh drinking water. What’s going to happen when this toxic sludge in the Dead Zone, is all hammered through and pierced by the first of the 6 proposed wind towers? 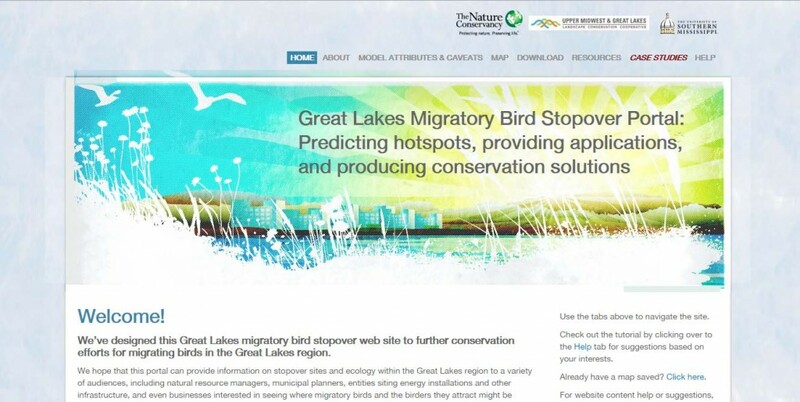 Not to even talk about the planned 1200 wind towers to ruin our water, kill the migratory birds, kill the fish stock, and destroy the beauty of Lake Erie? The thing about the current location in Lake Erie for this project, is all of this sludge, and all of this toxic waste and chemicals that have built up in the Dead Zone over the past 100 years is potentially going to be stirred up, and flow directly into the Cleveland Water Crib, thus polluting, toxifying, and poisoning millions of Ohio, New York, Indiana, Pennsylvania, and Michigan’s (all states who boarder Lake Erie today), children, young adults, adults and elder people. This is not even mentioning Canadian waters, for those Canadians who count on Lake Erie’s fresh water, plus the run off of potentially contaminated Lake Erie water, flowing over Niagara Falls into Lake Ontario, potentially contaminating all of Lake Ontario as well. We are talking lead, mercury, PCBs, dioxins, magnesium, arsenic and potentially the release, and explosion of underwater Lake Erie natural gas wells, that will be pierced upon the drilling into the Lake Erie bed rock, and in the Lake Erie Dead Zone today. Due to the industrial age, all of these toxic chemicals have been deposited in Lake Erie, in one form or another, since the mid to late 1800’s, early 1900’s and to the 1970’s. What public scientific studies have been completed to prove that a drinking water disaster will not happen? None, Zero, that I have seen published. What are the findings of the DOSECCA’s soil samples, taken from the bottom of Lake Erie in August 2015? If this all goes foul, and the water goes foul, and flows into the Water Crib, and there are explosions from gas wells, that kill 10 or 20 workers, if they are from Norway, or subcontracted US workers, who, what politicians, what mayor, what congressman, what senators, what governor, what corporations, LEEDCO, Who is going to be civilly and criminally liable to those citizens who are directly affected? And to the taxpayers of the State of Ohio and the United States, who are funding this project? WHY Lake Erie and Cleveland, Ohio? Now, our President Obama, during the White House correspondence dinner in the Spring of 2016 said, and I quote “It will be interesting to see what happens at the Republican National Convention in Cleveland this summer, if It (Cleveland) still exists after the convention”, to which there was arousing laughs of amusement. That the President of the United States is able to insinuate that an entire American city, under a joke to the national press and a government audience, is about to endure rioting and burning and destruction, of an American city, “if “It” still exists” after a major national event. This discourse is unfathomable, disrespectful, and tells you what the President of the United States thinks about Cleveland, what the Government thinks about Cleveland. This is Government bureaucrats pushing this entire green agenda down the throats of the American people, Clevelanders and Ohioans. The bottom line is, that this fresh water wind farm, being constructed right in the middle of trillions of gallons of the people’s fresh drinking water habitat, is being done in Cleveland of course, because no one, either locally or on a national basis, gives a damn about Cleveland, Ohio! I give a damn about Cleveland, Ohio! My kids have grown up drinking the water of Lake Erie. We see the beauty of Lake Erie, the most beautiful sunsets anywhere, we boat on Lake Erie, we fish in Lake Erie, and we see the threat that this wind farm has to the thousands of migratory birds that cross Lake Erie every season, but most importantly the imminent threat to the fresh drinking water for millions of Americans, and Canadians. Of course, when the environmentalist who don’t live in Cleveland, and the Norwegian firm that doesn’t even exist in the United States, that’s receiving $50M of our tax dollars, to build these 6, 500 foot towering offshore wind turbines, that potentially will foul up our drinking water, of course when they looked around the whole of the US, and said, where could we get away with doing this in the United States today? Let’s look at the map: Cleveland, Ohio, no one gives a damn about Cleveland, Ohio. News flash, millions of people do. But Cleveland is the mistake by the lake, it’s a national joke. Where can we get away with putting a monstrous wind farm, piercing the bottom of Lake Erie’s Dead Zone, potentially fouling up an entire fresh water drinking waterway, that is a fresh water supply for millions of American citizens? What fresh water habitat shall we use, so we can prove that wind farms can exist is fresh water? Where can we get away with this, and where should we do it? Answer, nobody cares about Cleveland, Ohio, do it in/to Cleveland, Ohio. Let’s talk about the Cleveland Water Crib. This impressive civil engineering feat was built to supply millions with fresh water. The Cleveland Water Crib project was built from 1896 to 1903, approximately 3.5 miles off of Cleveland, Ohio in Lake Erie. This Water Crib was built to catch fresh water, out in the middle of one of the largest fresh water lakes in the world, Lake Erie, because at the time, all of the Lake Erie near shore water intakes had been polluted by raw sewage, industrial waste, and garbage, that was being dumped into Lake Erie, during the late 19th, into the 20th century. So the Water Crib was built 3.5 miles off the Cleveland shoreline to deliver fresh drinking water to Ohioans. The Water Crib intake, has a 10 foot tunnel on the bottom of Lake Erie, that runs 5 miles from the Water Crib, with fresh water, to the Kirtland water intake, where it supplies 168 million gallons of fresh water a day, to quench the thirst and wash the Babies of millions of Ohioans every day. During the building of the Cleveland Water Crib, and the 5 mile tunnel to Kirtland, Ohio in 1896 to 1903, the men who built the crib and the tunnel had to drill some 350 feet into the bottom of Lake Erie, to secure the Water Crib where it is today, and to build the 10 foot wide, 5 mile tunnel extending to the Kirtland water intake area, to supply Lake Erie’s fresh drinking water to Ohioans. What happened many times during the drilling to the bottom of Lake Erie? There were a number of explosions, and fires, that included methane and natural gas explosions, based on the drilling into the bottom of Lake Erie in unknown areas. The result, 38 brave men were killed during the building of the Cleveland Water Crib, and the 5 mile tunnel to Kirtland, from 1896 to 1903. These men were burned alive, or suffocated to death during construction. If drilling to the bottom of Lake Erie, in the late 19th Century, to build the current Cleveland Water Crib, and the 5 mile fresh water tunnel to Kirtland, killed 38 men, what is the drilling to the bottom of Lake Erie, to secure the tower bases, or boxes in the Dead Zone, starting with 6, 500 foot wind towers, going to result in today? How many men or women will die during this wind farm construction, and who will be responsible for this? What toxic sludge will this stir up? As discussed before, we know the drilling is going to go right through the industrial sludge of potential PCBs, dioxins, mercury, methane gas, lead, magnesium and God knows what other concentrations of sludge, that are CURRENTLY SITTING QUIETLY AND UNDISTURBED, at the bottom of Lake Erie, in the Dead Zone. Once this Dead Zone area is disturbed, and Lake Erie’s fresh water and this sludge is stirred up, what is this going to look like, and how will this affect the current quality of fresh water in Lake Erie today? Particularly with the proposed wind farm so close to the Cleveland Water Crib intake system? Who Will Bear the Responsibility? What will this water look like and contain in toxicity compared to the water in Flint, Michigan? And if this water is not potable or drinkable for millions of Clevelanders and Ohioans, Americans or Canadians, and the People and their Children are harmed, who will be at fault? Will it be LEEDCO? Cleveland Mayor Jackson? Senator Sherrod Brown? Governor John Kasich? Congresswoman Kaptur? Congressman Joyce? County Executive Budish? And more? Who has thrust this great honor upon Cleveland and Lake Erie, one of the world’s largest and most reliable source of fresh drinking water resources in the world today, to host the first fresh water wind farm in the United States upon us, and potentially destroy our beautiful natural resource, Lake Erie, the drinking water, the fish stocks, and the migrating birds, and the beautiful sunsets? Today Lake Erie provides drinking water daily to over 11 million people, that’s on a daily basis! Lake Erie today has a shoreline of 871 miles, and holds on average 147 trillion gallons of fresh drinking water. Remember only 2.5% of the world’s surface holds fresh drinking water today. Lake Erie is one the most important natural resources in the Midwest, in the United States, Canada, and the World today, for fresh drinking water. Did I mention Canada? Do we realize that the same potential fouled up water, and the killed fish stocks, migrating birds, will have the same effect on all of our friends up north in Ontario, Canada, and the subsequent potential flow of toxic sludge over Niagara Falls, polluting Lake Ontario? Who in the US Government cares about Canada, the people of Ontario, and our Global citizens up north? Lake Erie is already experiencing major toxic algae blooms, from agricultural runoff, it’s polluting the lake, and causing major problems with our drinking water. AND now we will also host this potential burden of an off-shore wind farm, in fresh drinking water as well? No Thank You! Lake Erie is the shining success of the environmental movement from the 1970’s, after local, state and federal clean-up pollution efforts banded together, after the Cuyahoga River caught on fire in 1969 from a massive oil streak, caused by one of the local steel plants. This garnered Cleveland national attention as being famous for having one of only two major rivers in world history catching on fire: 1) the Cuyahoga River, and 2) the Nile River, when God set it afire, with flaming hail, as part of one of the plagues to let Moses’ people free, out of Egypt. This worked out well for the Old Testament Jewish people, however; the Cuyahoga River catching on fire did not work out so well for Clevelanders. For years we have endured, as Clevelanders, the wrath of the nation, mistake by the lake, the Cuyahoga River, the burning river, a lake and city so disgusting and so foul and so polluted, that why would anyone want to live in Cleveland? The incredible Environment Success, honor and the pride of the local Cleveland, Ohio State, and Federal Government people and programs that cleaned up Lake Erie, from the disaster that it was in the 1960’s and the 1970’s, is now in jeopardy. Why? By massive wind turbine poles, or untested boxes, piercing to the bottom of Lake Erie, just 3 miles from the Cleveland Water Crib, potentially dredging up almost a centuries worth of carcinogens, too many to list, flowing into the Cleveland Water Crib, and affecting our drinking water, and other US States, and Canadians drinking water. If this occurs, “It” will be a natural disaster beyond comparison, certainly to Flint, Michigan, which has gotten so much press, and empathy. In Flint, there is a search on to punish those responsible, not only by the EPA, but also among the many leaders and politicians, who stood by so stupidly, and let Flint, Michigan’s fresh drinking water be poisoned with lead, right under the noses of Flint’s citizens, and taxpayers. Is the EPA, local mayor, county executive, congressmen, senators, and governor going to sit by and let this potential disaster happen to Cleveland, and Ohioans on a massive scale once again? What are the consequences involved in the fouling up of Lake Erie’s fresh drinking water. In Flint, Michigan 100,000 residents, 3 times a day have to traverse across town to get fresh bottled water in big 5 gallon jugs, for drinking, for bathing, and to fulfill their daily ration. Why? They can’t drink their tap water. Why is this? Because a government body let a taxpayer funded decision happen, in Flint, Michigan, mostly under the radar, without input from its citizens, or what thoughts could happen to their fresh water supply. The same question should go to LEEDCO and all of the sponsors, politicians and business leaders, who would potentially foul up our own fresh drinking water supply from Lake Erie, by installing 6, 500 foot wind turbine tower poles, in the Lake Erie Dead Zone, bringing up sludge contaminated by lead, mercury, PCBs, dioxins, magnesium, methane gas, and God knows what else, over the past 100 years. Who is going to answer for this potential natural disaster, and the human hardship that this is potentially going to cause, to not 100,000 residents like in Flint, but potentially millions? The EPA has responded to Flint by forcing their district manager in Flint, Michigan to resign. If the wind farm, near the Cleveland Fresh Water Crib intake for Cleveland, fouls up the awesome fresh drinking water that exists in Lake Erie today, who will take responsibility? Who will be fired? Voted out of office? Face civil fines? Go to jail? Because of Flint, Michigan, US citizens and taxpayers have eyes wide open! So again the question has to be asked, why put a wind farm in one of the world’s largest fresh drinking water lakes, when the world today only has 2.5% of fresh water left on its entire surface? The answer is to push for renewable energy sources as a nationwide plan, so that some of the tens of thousands of wind turbines planned, by the renewable energy promoters in the United States, can be proven to work in fresh water, where the water freezes, and then we will see if the towers gets cracked down, causing a further environment disaster. Basically a $50M+ taxpayer funded project in 147 trillion gallons of American’s fresh drinking water, to see if it works. WOW! I wonder where else this $50M could be used for good use, maybe Cleveland Public Schools? Maybe to American Veterans? Talk about government wasteful/useless spending, with no thoughts or scientific studies on the potential disaster of such a plan, in an area where the citizens have some of the most abundant, green, low cost energy right on-line today. And why was this area of the country chosen for this “$50M trial,” because again it’s Cleveland, and no one cares! Does Cleveland and North East Ohio Need This Additional Energy Source On-line – NO! The biggest question is, why are we putting a wind farm in Lake Erie at all, when Ohioans have some of the most abundant, green and low cost energy resources already on line? There are 2 ZERO EMISSION producing Nuclear Power Plants within miles, on the shores of Lake Erie already producing “green” low cost energy for millions of Americans. These 2 Nuclear Power Stations are located just miles away from the proposed wind farm site in Lake Erie. The Davis Bessie Nuclear Power Station to the West of Cleveland produces 776 GWH of energy, and the Perry Nuclear Power Station to the East of Cleveland provides 858 GWH of energy, (one of the largest Nuclear Power Stations in the US), providing abundant energy to millions of residents of Cleveland, Ohio, and other surrounding states, with zero emissions, providing power to tens of millions of American citizens, businesses, and industries throughout the Midwest, with a very low cost sustainable, delivery and storage mode of energy. AND news flash, this is clean/green energy – ZERO EMISSIONS! And why is First Energy in the process of closing 6 coal fired power plants, 4 locally in Cleveland and Ohio? Ohio plants in Ashtabula, Oregon, and Eastlake, Ohio, killing 600 jobs, and affecting thousands of families? Because these coal fired power plants do not meet new EPA regulations for clean air. These EPA regulations (Which are currently under US Supreme Court scrutiny, due to the EPA’s Overreach of existing law under the US Constitution) are designed to reduce emissions such as mercury and other carcinogens. Could it be these same carcinogens, mercury and others are lurking in the Dead Zone of Lake Erie, and will now come direct to Clevelanders via our drinking water supply for consumption? So why is First Energy closing these coal plants, due to EPA government overreach? Why are they forcing 600 people out of work and affecting thousands of families throughout Ohio, due to EPA government overreach? And the local energy available is abundant and costs are down. Why? Because many utilities have switched from coal to low emitting natural gas, without impacting customer’s energy bills, and in fact lowering energy bills. So with the abundance of natural gas, at the lowest cost levels in years, and 2 local Nuclear Power plants nearby, why build a wind farm, in one of the largest fresh drinking water lakes in the world? Because it’s Cleveland, and the Government can do it, whether or not “It” messes with Cleveland, and the fresh drinking water that Lake Erie provides to millions of inhabitants throughout the City of Cleveland, the State of Ohio, and many other local states. No one cares! That is if “It” all goes well? If this project does not go as exactly planned, and fouls up Lake Erie’s drinking water, who will be in line to take the fall? Not to get off point here, but look what the NFL did to the Cleveland Browns. How could they move an NFL franchise overnight, the Browns, because they knew they could do it in a city where you know you could get away with it, Cleveland, Ohio. But if Cleveland becomes the new Flint, Michigan, who is going to pay the bill for the cleanup, who is going to be held civilly responsible $, who is going to be held criminally responsible and go to jail, for fouling up trillions of gallons of fresh drinking water? What politician will have to answer for Lake Erie, during their next re-election campaign? So Why Wind Farms in Fresh Drinking Water? So why wind farms, in fresh drinking water? With a 500 foot pole, with turbines on it, and in the middle of one of the world’s largest fresh drinking water lakes in the world, why not do it on land? A similar project for offshore wind, in Lake Ontario, Canada was defeated in 2007, by thousands of local Ontario Canadian residents. Why did they reject their government proposed offshore wind project? Because it was going to foul up their fresh water. And there was no scientific evidence or research pointing to the facts otherwise. The other issues of the Ontario residents where the safety of their local fish stocks, bird migration, and disruption of the beauty and views of the area, not to mention the noise these huge turbines make when spinning. Try star-gazing, or watching the sun set, with a loud Wump! Wump! Wump! noise reverberating across miles, of one of the World’s largest resources of fresh drinking water. So, without Lake Ontario to put up a fresh water wind farm, what do the government bureaucrats, and renewable energy people, and their industry, and their leaders need? An example where a wind farm in fresh drinking water works. And where can this test case happen for North America’s first major offshore wind farm, approved by politicians, and local leaders under their citizen’s noses? Why of course, Lake Erie off the coast of Cleveland, Ohio. Why? Because we can screw Cleveland and no one cares nationally. If it goes awry, who cares? No one. Not even the leaders of this region, who are acting plain stupid, by not seeing the potential obvious reasons, not to mess with Lake Erie’s fresh drinking water. This is a potential Worldwide Environmental Disaster waiting to happen. Myself and thousands of other Ohioans and Canadians completely reject this decision to place this wind farm in the fresh drinking waters of Lake Erie. With this in mind, I am sending this note, to the Plain Dealer, LEEDCO, Ohio Congressmen, Ohio Senators, both Ohio US Senators, Ohio’s Governor and the head of the EPA, and other leaders and media involved. We’re going into this project with eyes wide open. If Flint, Michigan happens in Cleveland, on a more massive scale (X1000) many people will now know of the potential disasters, that can occur here on Lake Erie, due to this wind farm project. Now, what no one talks about, that I was privy to with about 50 other concerned citizens in attendance, was a very lowly advertised public information meeting, at the Cleveland Public Library, some 2 years ago about this project, put on by the sponsors of this project, so they could check the public awareness box. Presented at this meeting was this $120M, partially tax funded, 6, 500 foot windmills going up in Lake Erie, at $20M per windmill. And this was explained at the meeting as the test project for what? It’s the test project to industrialize Lake Erie, by putting up 1200, 500 foot windmills at a cost of $24 billion! The next American “New Deal,” but this time for green energy. Why? Because we need the power locally? No, that’s not the answer. Why? Because it’s Cleveland, Ohio and Lake Erie, and we can screw the Citizens, and their drinking water, and the Sportsmen, and the fish stocks, and the bird migration in the name of clean energy! Yes, only in Cleveland. We believe that this is completely moronic, ironic, unfounded thinking, with no reason, with no payback, no supporting science, and a disaster waiting to happen! 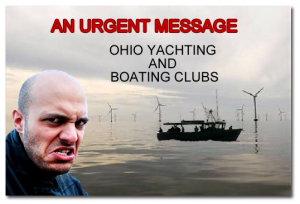 Ohio Citizens, I urge you to Rise Up in opposition to this wind farm, planned foolishly in one of the world’s greatest and largest fresh drinking water Lakes in North America, and the world. Lake Erie is the State of Ohio’s Greatest Natural Resource, and it must be protected! One of the other reasons that offshore wind farms have been rejected, mostly in salt water, has been based on Blight and ruining of beautiful scenic waterways and views around the world. Why ruin the scenic beauty of Lake Erie with 500 foot skyscraper wind towers, Blighting Lake Erie and its beauty? Can you imagine 1200 of these 500 foot wind mills all over Lake Erie? “It” will create on Lake Erie, the clean energy equivalent and disaster of Lake Maracaibo, in Venezuela. There are many American states, and local citizens who have understood the potential disastrous implications of wind farms early on, and taken action against wind farms on their land. For example, the State of Vermont, one of the world’s most environmentally friendly and green states, has rejected numerous wind turbine farms for years because of Blight. In March 2015, the North Eastern Vermont Association, a regional planning commission, which covers 21% of the state’s land area, voted in favor of a resolution to allow no further development of industrial scale wind turbines in the entire region of the State of Vermont. Vermont’s state legislators are also introducing bills to ban large wind projects completely. The State of Vermont is taking these measures, because they believe that wind turbines create Blight and contradict the state’s main income of tourism. It also protects Vermont’s rural dark skies ordinances, for stargazing. Many similar proposals are being introduced in states from Iowa to Maine, and in providences in Canada, across small towns, and to the state levels, to ban wind turbines and wind farms outright. And these are wind farm projects going on land, not even considering destroying fresh drinking water, fish stocks, and over water migrating bird’s entire flocks. Who Will Bear the Responsibility If Disaster Strikes!? So why does Cleveland get the honor of the first fresh water wind farm, and why in Lake Erie, one of the largest fresh water lakes in the world today? Because it’s been done under the radar and no one cares. Again, it’s Cleveland, remember? (“It may not exist.”) Our local leaders, bureaucrats, and politicians are selling us out, in the name of green energy, or they are just plain stupid, to be taking such a risk, with their own careers, and the potential civil and criminal penalties, that may occur from their approval of this misplaced green energy project, that could be a an Environmental Disaster on a Global scale, waiting to happen? On the campaign trail, Democratic presidential candidate Hillary Clinton expressed outrage, and framed the Flint, Michigan water disaster as a civil rights issue. Will presidential candidate Hillary Clinton frame a similar disaster in Lake Erie, due to the building of 500 foot wind towers piercing the Dead Zone of Lake Erie, fouling up Lake Erie’s drinking water, similar to the Flint disaster, will she also frame this wind farm project as a civil rights issue? What government officials should be held accountable personally, civilly, and their agencies to pay the civil fines, and indict specific officials on a criminal basis, if Lake Erie’s fresh drinking water is poisoned? Who will be held accountable for Lake Erie’s fresh drinking water to Cleveland, the surrounding communities, and the 11 million people that rely on Lake Erie’s fresh water daily, if it is fouled up by this industrial “green” offshore wind farm? Where is the Public Record of Who Will Profit from this US Taxpayer $50M Funded Project? According to John Funk, from an article in the Cleveland Plain Dealer, the Norwegian Wind Company to build the LEEDCO offshore turbine wind farm project, is Fred.Olsen Renewables Lake Erie Energy Development Company. This is a Norwegian company, with experience in building in the North Sea, mostly salt water offshore wind farms. The Plain Dealer article also states that Fred.Olsen will buy the non-profit LEEDCO assets, but for how much $? The article does not state how much the Fred.Olsen Company will buy the LEEDCO assets for. This is an undisclosed amount. How much taxpayer money is to be used for this purchase of LEEDCO, and what specific executives of LEEDCO, and what affiliated parties, including business people who invested in LEEDCO and politicians, will share if any, in the purchase price of Fred.Olsen Renewables Company purchase of LEEDCO? Has LEEDCO donated money to the campaign funds of local, state or US representatives? This could be a good investigative story to pursue by John Funk, or others at the Plain Dealer, or at the Wall Street Journal, or other media outlets copied here, just to make sure that $50M in American taxpayer dollars $ are being used correctly, and no fraud or payoffs are involved, similar to what we have seen with other renewable green energy projects, that have received Billions of dollars $ of American’s taxpayers money, with no accountability. This list includes Solyndra Solar’s owners, investors and executives as one example, and also the acclaimed Billionaire, who uses US$ taxpayer’s subsidies, for his fledgling electric car brand, Tesla. This is Green Crony Socialism $! – Follow the money! Does anybody know, that Fred.Olsen has a 50 year lease on Lake Erie from the State of Ohio? Was this project and timeframe (50 years) granted by the Ohio State Legislature? Why does the Fred.Olsen Company need a 50 year lease, when they are going to build a pilot project of 6, 500 foot wind turbines, located 8 to 10 miles northwest of Downtown Cleveland, to be completed by 2018? Could it be that this 50 years is the timeframe needed for the future project to put up 1200, 500 foot wind turbines, to completely industrialize Lake Erie? 50 years? My God, what a disaster that would be! Has this 50 year lease been granted by the State of Ohio for one half of Lake Erie, to a foreign company based out of Norway? (The other half of Lake Erie is of course Canadian sovereign property). How about some good old fashioned journalism here, or an Ohio Senate investigation of this project here? What says the Army Corp. of Engineers, or the Great Lakes Water Compact about this project, and 50 year lease? What would 1200, 500′ towers do to the shipping lanes in Lake Erie and the Great Lakes? Decimate the shipping industry, and the on-shore ports and businesses as well? Which Direction Should These Massive Towers be Facing? How to Store the Energy? The other big question for the Fred.Olsen Company, is which direction are they planning to face these huge wind turbines? A lot of times the wind coming across Lake Erie comes directly from the West. We know this because when you look at the weather map, and you want to see the weather coming into Cleveland, you typically look to see what’s going on in Chicago west of here, and the weather is somewhat the same coming to Cleveland. However; the wind comes a lot across Lake Erie from the northeast, or easterly, so do you face 2, 500 foot towers West, and 2, 500 foot towers East? Also when the water is dead flat on Lake Erie, you know the wind is coming directly from the South, or that there is no wind at all. If you look at the hulking wind turbines that are located off of I-90 near Euclid, Ohio, many of them are sitting idle even when the wind is blowing 20 mph. Why? Because the wind is not blowing in the direction that they are sitting, to turn and generate any power. So these huge hulking towers much of the time are just sitting there doing nothing. Not turning, not creating energy, and not storing energy, even in very windy conditions. Just sitting there, looking Big and Ugly! Guess what? Even when these wind towers are generating energy from a stiff breeze and turning, they cannot be relied on to store excess energy, as there is no excess energy storage for the wind turbine energy industry. The energy must be used immediately, or it will simply vanish. This is a huge dirty secret of renewable energy. Wind energy has zero excess storage capacity. This is why they need government subsidies, our tax $, because: There Is No Break Even on this costly energy, as it cannot be stored for future use, and the efficiency of when and where the energy is to be produced, is not even known. This Wind Farm Project Will Never Make Money $! Now why does a company have to come all the way from Norway to do this wind farm project? Why not use First Energy or one of the great local American energy companies to do a similar project? Surely they could sub-contract a foreign firm with experience to do this project. The answer is because: There Is No Break Even to this project, and also the Potential Liability. 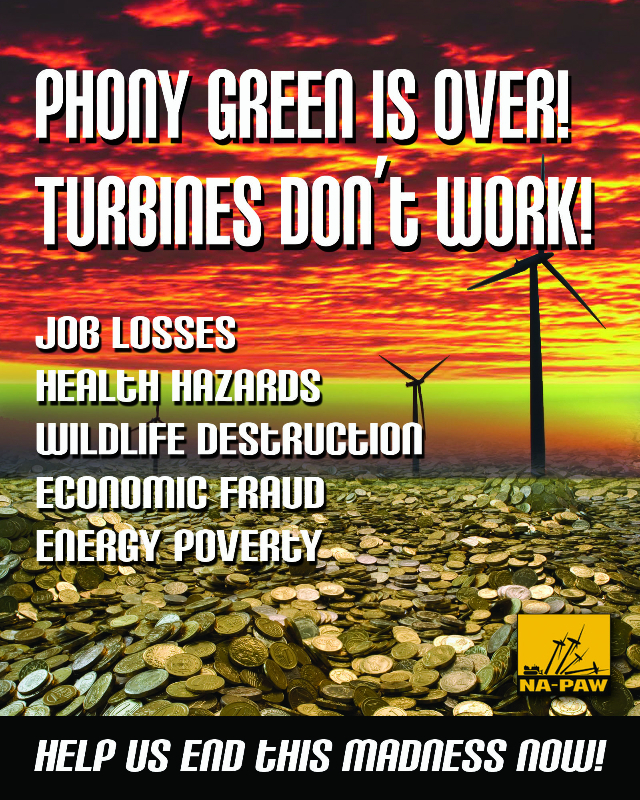 The energy produced and charged to consumers will never provide enough funds to pay for this project, let alone generate a profit for the companies who run these turbines, Ever! And what consumers are going to pay triple the cost for wind energy for their homes, when they can get natural gas or Nuclear Power locally at 1/3 of the price? The answer: Very stupid consumers, or consumers who will have these energy price increases jammed down their throats. Remember President Obama promised that electricity prices would necessarily skyrocket triple in costs under his administration. Now let’s talk about the proposed way in which the wind turbine energy will be transferred to the shore, once these massive poles pierce the bottom of Lake Erie in the Dead Zone. 10 miles of cable are to be placed on the bottom of Lake Erie, all the way to the shore. These cables sitting on the bottom of Lake Erie are going to dredge up even more sludge, PCBs, dioxins, carcinogens, and drinking water issues in all the areas that they touch, and where these cables are secured to the bottom of Lake Erie. Think of the hundreds of miles of cable needed to be fastened to the bottom of Lake Erie, for 1200 wind towers! The Lake Erie wind farm project in itself is to be subsidized by me and you, the US taxpayers, with our hard earned money going to a foreign corporation, that is potentially going to foul up the fresh drinking water, in one of the World’s greatest fresh water natural resources, and largest reservoirs of fresh drinking water in the world today, Lake Erie, all in the name of clean and green energy, makes sense? Fred.Olsen Company would be wise to study what happened to BP, after their Deep Water Horizon disaster. BP paid the US government 20B$ dollars, and almost went bankrupt! Tort law in America is a little different (joke) than Tort law in Europe these days. And the US Government and politicians of all stripes, business and green energy leaders of this project, once your friend and loyal supporters, will quickly throw you and your entire company under the bus, and vanish themselves, when they are called upon to be responsible for their actions, should the Lake Erie wind farm project turn into a fresh water drinking, and environmental disaster! Attention all private and public servants receiving this note. Don’t be caught on the wrong side of history with regards to striving for what you truly believe is the noble cause of clean and green energy, on this project. Don’t allow this vision of clean and green energy to potentially destroy the fresh drinking water, and potentially poisoning millions of Clevelanders, Ohioans and Americans, destroying the natural beauty of one of the greatest natural resources in Ohio, and North America, killing off the greatest walleye and perch fishery stocks in the world, and causing the deaths of thousands of migrating birds a year, possibly some near extinction, due to your complicity in the proposed and ongoing Lake Erie wind farm pilot project, and full industrialization of Lake Erie, with 1200 wind turbines, from a 50 year lease, on OUR Great Lake Erie. The full master plan of this project, is for the full industrialization of Lake Erie, as put forth by LEEDCO, Fred.Olsen, and Cleveland local, Ohio State, and Federal Bureaucrats, and green energy leaders, who have planned and approved this giant offshore wind farm, to be placed in the 147 trillion gallons of the fresh water shed of Lake Erie, where the water in Lake Erie “Is” for the exclusive use for millions of American and Canadian citizens, for drinking, bathing, recreation and business. This “clean” energy wind farm project, is set to start in 2016, and proceed for the next 50 years, and will completely industrialize and destroy Lake Erie, with no cost break even, in a region that does not even need the excess energy. And for what?! To prove that “It” can be done. It’s not too late to do the right thing, and stop this potential disaster today! Back out now, before it’s too late. Think Flint, Michigan times 1,000, and you being on the back end of that. Thank you for your review of this globally important fresh drinking water and environmental habitat issue. Cleveland Power of Wind Action Team monthly meeting – Wednesday, October 10, 2018, 6:50pm, Brooklyn branch of the Cuyahoga County Library, 4480 Ridge Road, Brooklyn. Our guest speaker this month will be Mark Pischea. Mark Pischea serves as the President of the Conservative Energy Network (CEN), an organization which supports and connects state-based conservative clean energy and energy efficiency organizations throughout the nation. Thank you for your comment and the information. We forwarded the information about the Cuyahoga County Library meeting to our Cleveland team. We believe with the strong commitment of people like you, we will win this. It is an obscenity beyond imagining. The Great Lakes need an offshore moratorium. Watch our site for more information on this initiative.